Working for a huge chain's no doubt inspired plenty of people to try and do it better on their own, though working in a huge chain's only inspired T-Pain to go out and buy a matching hat. 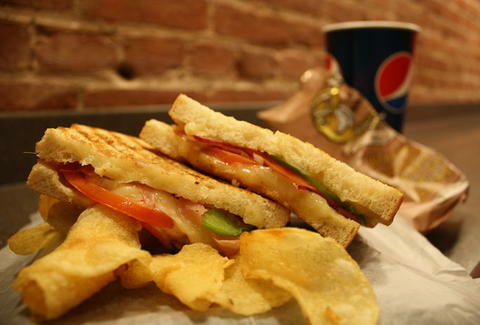 For an indie sandwich joint run by a former chain-ganger, press on to Amorini Panini. From a Virginia Tech grad who spent four high school years slogging footlongs at Subway, Amorini's a Penn Quarter lunch spot lined with cedar wood accenting, exposed brick, and old photographs of DC, and armed with eight industrial presses -- they could totally have gotten ten, but they're not trying to max out or anything. For panini purists, they're dishing five classic styles like the provolone/bell peppers/red onion Chicken Basil Pesto, the Bacon Cheddar Somerset with "double bacon" and "double cheddar", and a hard salami/pepperoni/smoked ham Italiano that'd inspire you to hey-mambo, if you weren't bloated with hard salami/pepperoni/smoked ham. New-schoolers can gobble up six signature 'ninis like the pepper jack/bell pepper/ranch (or blue cheese) Montana Buffalo Chicken, and the pulled pork/smoked ham/cracked peppercorn mustard Havana Cuban; and a range of morning-wiches (like a bacon/egg/cheddar or a prosciutto/egg/provolone) dubbed "Breakfastinis" -- also what Kim Cattral needs just to get out of bed in the morning. But it's totally cute and endearing when she does it! For lighter fair, they've got rotating gourmet soups and fresh salads like a grilled chicken caesar, or a casa with grape tomatoes, sliced cucumbers and choice of dressing -- which in T-Pain's case, will just get ridiculous.